There’s no better way to explore London than on an open top bus tour! Taking you to the doorstep of the capital’s most famous landmarks and locations, you’ll be spoilt for choice at where to discover first. Whether you want to stay onboard and soak in panoramic views of Westminster Abbey, Buckingham Palace, St Paul’s Cathedral, the Tower of London, the Shard and more, or hop-off to explore London by foot, you’ll be sure to have a day to remember. Have 24 hours of unlimited hop-on hop-off on 4 routes and over 60 stops. Hop-off at Oxford Street for a spot of shopping, visit Westminster to see the Houses of Parliament, Big Ben and Westminster Abbey, stop off at Trafalgar Square for Nelson’s Column and take the short walk to the bustling Leicester Square and Piccadilly Circus, get up close to the golden gates of Buckingham Palace and much more – the choice is yours!! 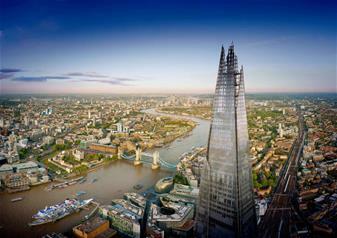 Enjoy a visit to the tallest building in Western Europe – the Shard! This spectacular skyscraper offers you views from 800 feet above ground level across one of the most beautiful cities in the world. Spot the London Eye, St Paul’s Cathedral, the Tower of London, Wembley Stadium, Tower Bridge and many more. With your 24 hour hop-on hop-off bus tour ticket, you’ll get to enjoy a fascinating free walking tour through London. Choose between The royal Walking Tour including the Changing of the Guards or The Beatles London Walking Tour.